The Pony Waldschänke is one of the most attractive and unusual recreation areas in and around Hamburg. Situated in the idyllic Klövensteen, the restaurant offers a cozy atmosphere with home made food. 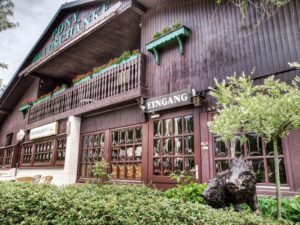 Born out of a small hunting lodge in the 1930s, the restaurant seats 220 people indoors and 300 outdoors and offers traditional German food and drinks.